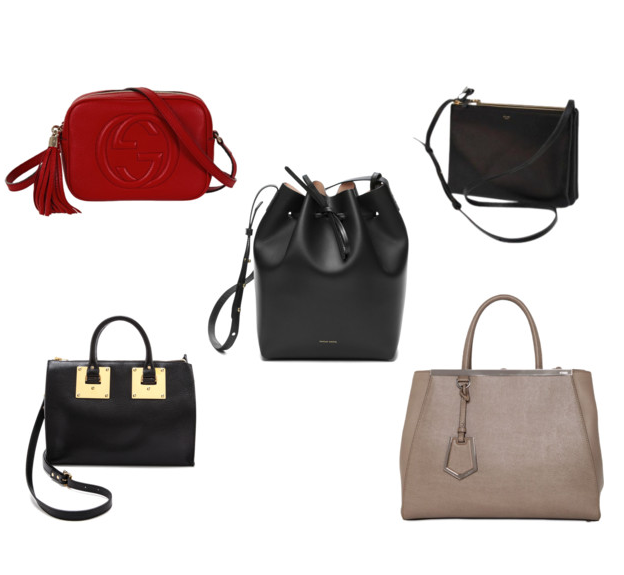 my 5 dream bags. by “dream bags” I mean: “bags I will purchase when I win the lottery and/or when I have saved up for years because they’re d*mn expensive”. I like bags that are streamlined & simple. I don’t mind hardware but I want it to be used judiciously & with purpose. I prefer black (can’t you tell?) because it’s timeless, goes with everything, & doesn’t get dirty as quickly, but I also love a good taupe or grey and a classic red. red is a tricky color for me – it has to be the right shade where it’s rich & attention-grabbing without going over the top. the red bag of my dreams is the soho disco crossbody from gucci. I’m usually not into logos, but I actually love how modern & graphic the gucci logo is, and on such a small bag, I think it actually looks more like a design than a monogram. plus the tassel…just a nod of whimsy & 70s freedom. the other crossbody on the list is the céline trio in black. it’s sleek & subtle, and the design is genius – it’s like 3 bags in one (which, for the price, it better be!). for big bags, there are two that have made the cut: the sophie hulme bowling bag & the fendi 2jours tote. sophie hulme exploded on the scene last year with this bag, but it was the less popular bowling bag that caught my eye. I prefer its east/west design to the tote, and I love that it’s a no-frills bag except for the edgy metal plates near the handles. the 2jours tote is the exact opposite – it’s classic & prim through & through, which is usually a little too traditional for my taste, but something about the metal trim across the top, the hang tag, and its angular shape gives it enough of a modern touch that I absolutely love. last but not least, the mansur gavriel bucket bag, aka the bag that sold out everywhere last year. this bag is perfect. it’s striking in its simplicity. I’ve debated back & forth between which color to pick (I’m torn between the brandy & the black), not to mention which lining to choose. my current favorite is the combination above: black exterior with a ballerina pink lining. priced at $495, this bag is by no means cheap but it is the most affordable of the 5 I’m dreaming about by a long shot. I’ve been saving up my pennies on the side since last year for this baby, possibly as a “congratulations for getting into nursing school” gift to myself this fall (cross fingers). I believe in sartorially pleasing carrots. wink.